Home World & People Carnivore Diet – Healthy or Harmful? Encouraging children to eat vegetables is a daily dinner battleground for many parents, but what if eating a balanced meal of meat and two veg is not as good for you as mum believed? Some people are turning away from the five-a-day mantra to take up the meat-only Carnivore Diet. Carnivores argue animals with large teeth for biting and ripping flesh are meant to eat meat and food based on plants is not a necessary part of the human diet. This thinking goes against the grain for most of us, but what are these claims and can the carnivore or ‘zero-carb’ diet really be good for humans? Some humans only eat meat because they do not have any other sources of food. Inuits living in the frozen wastes of the Arctic Circle live off a diet of flesh from seals, whales and fish, and they do not seem to have any health problems from their lack of fruit and vegetables. The diet is stripped back to the bone, so to speak. Eat when hungry and stop when your full is the main rule. The purists stick to meat, fish and eggs, although some carnivores argue in favour of dairy products because they come from animals as well. A typical day is a breakfast of eggs and bacon, lunching on a steak with hamburgers or fish for dinner. Coffee is allowed, although stricter carnivores opt for a mug of bone broth. No plant foods are permitted – so salads, herbs, ketchup, fruits and breads are out. Fatty meat cuts and oily fish, such as salmon, are preferred as they taste better when cooked. Poultry and game can add some variety to a carnivore diet. In the short term, plenty of carnivores would argue their diet is fine. Many would say they feel fitter and contrary to opinion, lose weight, as they do not have carbohydrates from pasta, bread or potatoes as part of their diet. Besides packing protein, the carnivore diet also cuts out sugar in most forms – including lactose in cheese and milk for those shunning dairy produce. Most carnivores recognise the human body needs a dose of certain nutrients to function properly and feel these are provided by eating meat. But like following any regimen, anyone on the carnivore diet should take advice from their doctor. 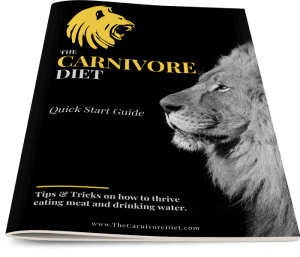 To find out more about the Carnivore Diet and what it involves head on over to www.thecarnivorediet.com and register to get the first copy of the eBook.